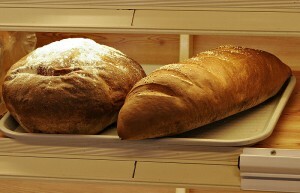 Breadmaking can teach us a lot about social media and marketing. I bake bread, and I’m a wheat snob. We have a tabletop wheat grinder, and I buy my wheat in bulk, from Montana, in 50 pound buckets. Wheat isn’t ground until just before I make bread, to ensure the highest nutrition content and best flavor. My personal favorite bread is a mix of freshly ground Prairie Gold and Bronze Chief wheats, with olive oil and local honey. Sometimes, my recipe varies. Occasionally, I mix the good wheat with processed white flour, vegetable oil, and white sugar. When I have plenty of time, I’ll add in sourdough for an extra zing. When I make my bread, I use my Kitchenaid to mix it, making enough for 3 loaves at a time. (Teen-aged sons have huge appetites.) I don’t follow an exact recipe. Humidity impacts whether I use more or less flour, and I pour it in by the 1/3 cup and finally tablespoon at the end until it looks right. Pizza dough and dinner rolls have their own variations as well. When the dough “looks right” and bounces back, I often dust it with flour for a final knead by hand. Know your audience. Choose the ingredient mix your audience likes best. Select your end product before you begin. My dinner rolls use milk and butter. My bread uses water. My pizza dough has a mix of bread, all-purpose, and fresh wheat flours. Knowing what you want to make helps you efficiently gather your materials with the least waste. Technology helps. I used to knead all bread by hand. My Kitchenaid helps me multitask and uniformly blends the yeast into the dough. High-tech tools can save you time with social media for a better end product. The personal touch still matters. I tweak each batch’s ingredients according to climate, and I always knead by hand at the end. Social media still requires a human personal touch. Your gut instinct on what feels right and works well improves with time and experience. Blend old school and new school according to needs. If it were up to me, I would be a purist with fresh, local ingredients. There is still a place for the white flour and white sugar, used in the right amounts at the right times in the right products. With social media, don’t throw out all old school marketing tools and techniques; they can still fill a role when used well. Rising takes time. Don’t rush your bread. My dough rises once on its own and a second time once I put it into pans. The sourdough that can take twice as long to rise will give a zing that can’t be matched. The same holds true of some marketing campaigns. Keep watch and baby it while it bakes. If you want an extra shine, brush an egg, milk, or butter wash on your bread just before baking or brush a butter wash on it just after baking. That sourdough crust might have a better texture if you put a pan of water in the oven while it bakes. All marketing requires that same watchful eye for adjustments and tweaking. Timing while baking matters. Don’t bake it enough, and it’s gooey in the middle. Bake it too long, and it’s burned. Remove it from the pan after it’s done to cool, or the sides get too soft. Make sure you end your marketing campaign at the right time. Leave them wanting more. Don’t oversaturate your market but always give them just enough to fill the appetite but want more next time. Businesses that master the perfect mix of old school, new technology, a personal touch, and timing by way of social media will enjoy the same sweet success I savor when a great loaf of bread comes out of my oven.